We assist you in planning your tours, organizing your transport to the start and end points, provide maps, inform you about weather forecasts and conditions, and reserve lodging for you at cozy hotels and restaurants serving local specialties. Your tour will take place in one of two ski regions, depending on weather and snow conditions. Upon request, we can also organize a certified Alpine ski guide. 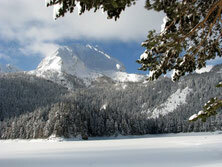 You will benefit from the guide’s years of experience in the Montenegrin mountains.